"Delightful book about finding love and taking chances." DAUGHTERS OF THE BRIDE is a wondrously heartwarming and funny story about three sister who on the surface couldn't be more different. What they do have in common is their mother who survived losing her husband early on, raising her three daughters and finding her way out of a myriad of problems left behind after his death. Every step forward was at a cost. Not only to Maggie who had to step up to the bat but to each of the daughters, Rachel, Sierra and Courtney. Each one had different reactions to their new situation. Each sister grew up with self-image issues and candidly self-confidence ones as well. One felt invisible, one felt put upon and the other unlovable. Wow -- certainly Maggie didn't bet on this outcome for her three daughters but there it is. 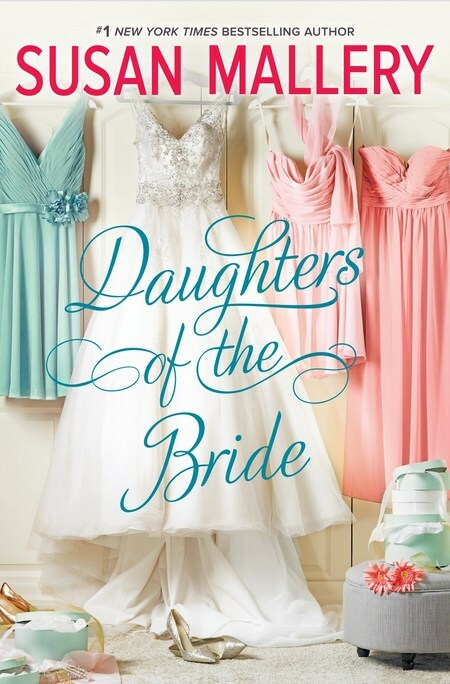 How they work through these issues is the core of DAUGHTERS OF THE BRIDE by Susan Mallery. DAUGHTERS OF THE BRIDE is quite a study of sibling relationships and Susan Mallery is blunt and honest. The members of this family come to life on the pages of this engaging tale of finding yourself even though the path is murky and at times defeating. In the end love will be the strength needed to tie up all the loose ends. So pull up a chair and enjoy this newest addition to amazing stories told by master story teller Susan Mallery. Courtney the baby always underestimated by everyone but most devastatingly by her own family. So any attempts to marginalize their remarks -- at times rather caustic -- always hurtful -- were done in secret. Living down to people's expectations, a self-fulfilling prophecy, on the surface Courtney learned to keep her accomplishments a secret. Rachel the oldest was used to taking on responsibility and shouldering the needs of both her sisters and their mother to the detriment of her own well-being -- emotional and physical. As she best describes her life -- stuck in limbo. Rachel has a hard time breaking the mold. Sierra the middle child most often felt as odd man out. Now on her third engagement she still ponders the dilemma of why there is no spark or excitement. Could it be that Rachel is looking for love in all the wrong places? Thanks to Susan Mallery's pure genius the interaction between the three sisters is so real you fully identify with them or at least see them as real life characters. In DAUGHTERS OF THE BRIDE Susan Mallery includes you in the action and that definitely raises the bar. Be prepared to take sides, form opinions and alliances and most definitely develop friendships with Sierra, Rachel and Courtney. The three of them manage to shake off the consequences of a less than comfortable childhood and develop the strength to move on. Cheers!!! I absolutely did not want this beautiful story to end. And although the ending was lovely and exquisitely crafted I wanted more. I did not want to leave these wondrous characters. DAUGHTERS OF THE BRIDE is destined to be dog eared.